Spent Saturday and Sunday working with Kerry entertaining the Yarnies, Darnies, Spinners, Felters and Dyers in a hall at the Royal Welsh Showground in Bulith Wells at Wonderwool Wales. There I am for two days with two young boys a Suri and Huacaya entertaining hordes of creatives from all over the UK who have descended on this textile festival with a hunger to touch and feel the most colourful, creative and wonderful materials created in the UK. I have to say I had a ball. The show is really well organised, the setting idyllic, the people are delightful, the food was very good indeed. Oscar the Suri was the star of the show. Nearly all the crafters and creatives knew the fibre well but found it a real treat to meet the source of their luxury fibre munching hay and haughtily staring them down as only Suris can do. I had a blast. Unfortunately as we set off at the crack of sparrowfart on Saturday I left my I pad and phone at Toft by accident so couldn't take any good pics. Maybe next time. Lavender Park Tulley and his mates are enjoying the dry readying for the off. If your breeding plan is veering toward Lavender Park Tullley then book early for he'll be a busy boy real soon. We are currently shuffling the females into their various groups for birthing and mating and on. May 1st we shall kick off making the next generation for 2016. A brand new RTV 900 caused much excitement yesterday on our return from Amsterdam. We all checked it out and young Lordy needed two trips to satisfy his curiosity. 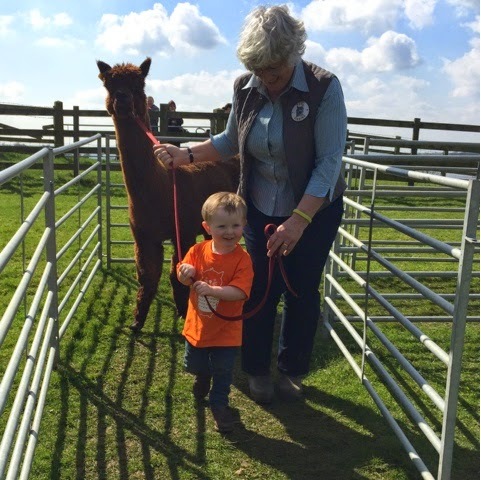 Here he is checking out how well it carries poeple in the back as we check out the alpacas. The back of the truck seems to be his most favourite place at the moment. Will he feel the same when our old one returns fro the menders today? Who knows? 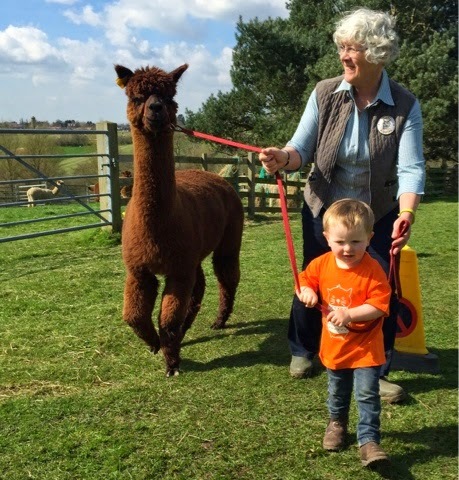 Who cares we spent a good hour checking out the TOFT Alpaca herd yesterday. The pregnants are looking.... well pregnant! Will you look who's here in Meppel selling his wares ? 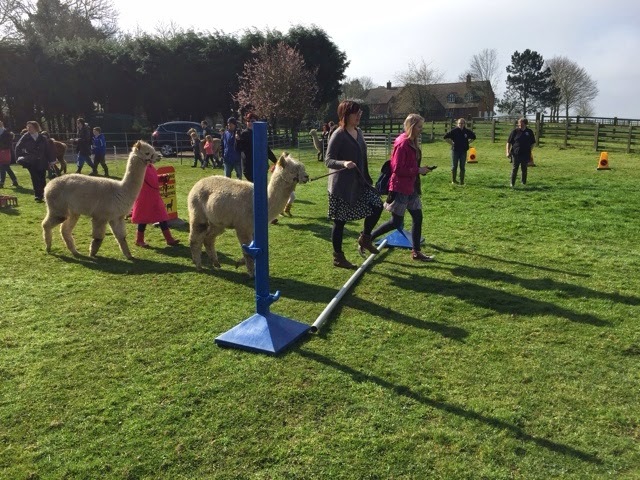 We were sat there having a wee break in the alpaca judging at lunchtime, as you do, and who should strut into the ring but TOFT Ikrit as a participant in the stud service auction to raise funds for the event. I had a quick word and he told me he's settled in Holland ok, has serviced a few Dutch ladies already is busying himself with some young maidens and has many more in line... Mind you he finds the language a bit tricky but is taking classes in between donating his genetics. Keep it up old son and may your offspring do TOFT proud! 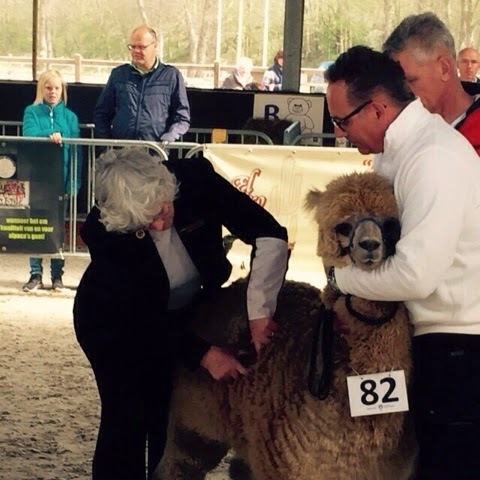 Well here we are in deepest Holland with Shirley judging 140 alpacas at the Alpaka Show Meppel and me acting as companion animal. 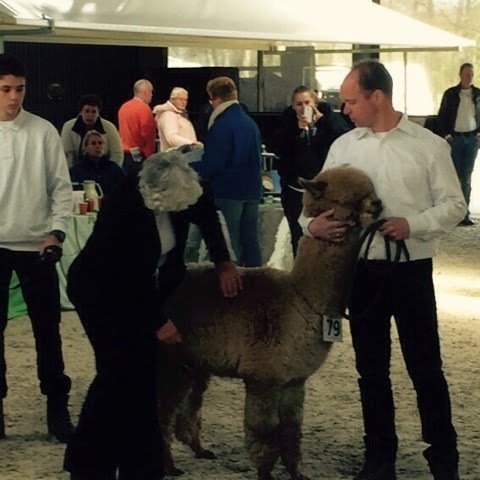 Great to meet new friends and old here in a Holland in a lovely setting bedecked with trade stands- some Alpaca some not but obviously enough of a draw as the crowds have been rolling I since about 10am. Here's a few snaps of Mrs TOFT Judge strutting her stuff in a very competitive turn out. 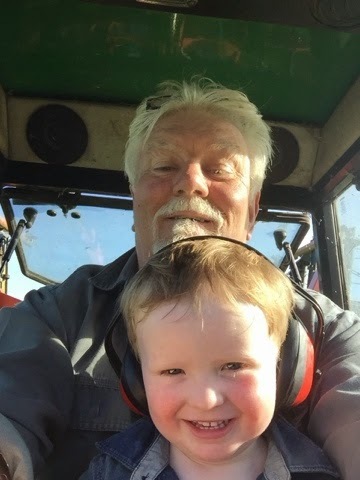 Young Lordy bounced in from nursery yesterday to find Grandad harrowing the alpaca birthing paddocks. He immediately grabbed his ear defenders and came out to help. .. as you do...Perfick! 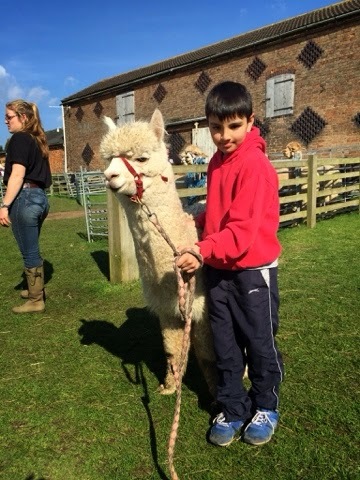 Child exploitation is rife at TOFT Alpaca Stud! 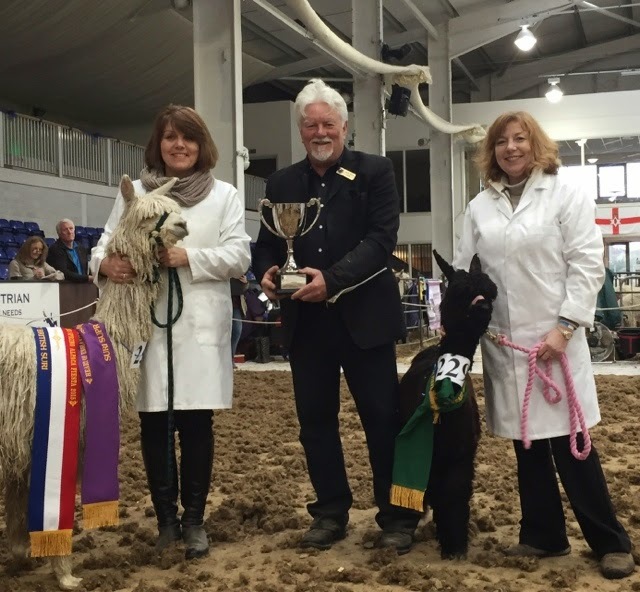 After 12 years judging alpacas all over the UK and Europe it was a real treat to judge a show in my own backyard. 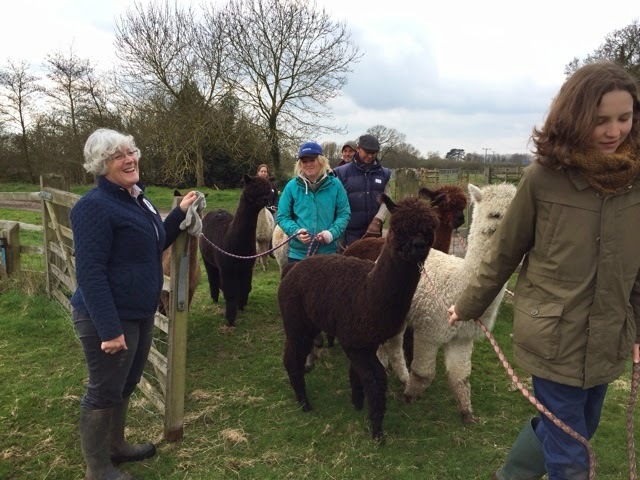 It meant TOFT couldn't show and I have not been able to take a detailed interest in my friends alpacas since last summer but it was worth it for the fun we had this weekend. I loved every second of it from start to finish. Not only the challenge of the judging but also the pleasure of being amongst friends who all speak English and get your jokes. It's fun in Europe too but it's great when you all. Get the funnies straight away. It was a blast! 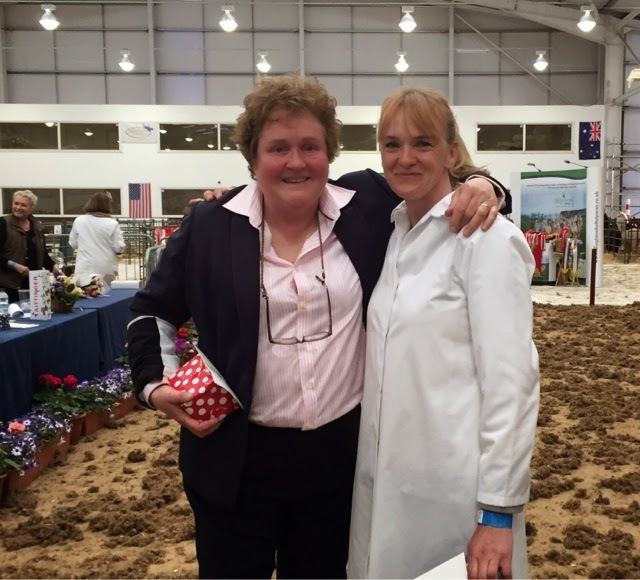 I thank Lulu Oliver of Lusi Alpacas for inviting me and for organising a real professional event with a great atmosphere that will only get better as it settles I to its new home. 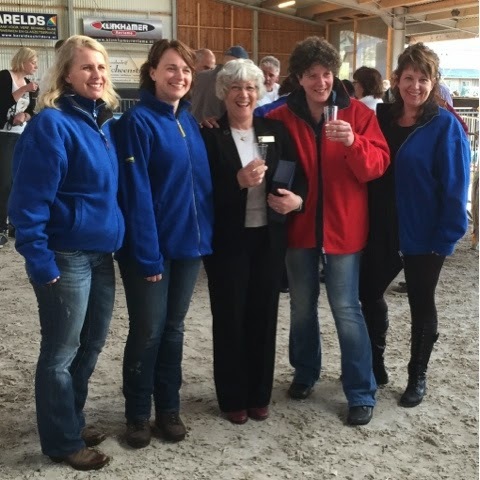 I thank Liz Barlow for her work as chief steward, my wife Shirley for show secretary and Jo Bridge of Windy Ridge and Viv Cook of Oakton Alpacas who combined a day each as my apprentice with the alternate day as Ring steward. 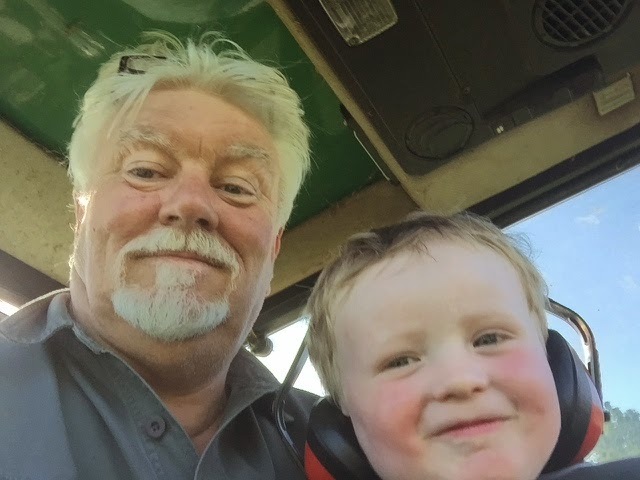 This worked real well and I was very impressed with both my apprentices and wish them well as they go onto gather more experience before certification. I feel if they go to approach their learning with the confidence they showed this weekend they will go on to make a real contribution in years to come. A huge thanks to all those white coated stewards who hustled and bustled to keep the wheels running and didn't get in the limelight. We know who you are and what you do and we thank you all. 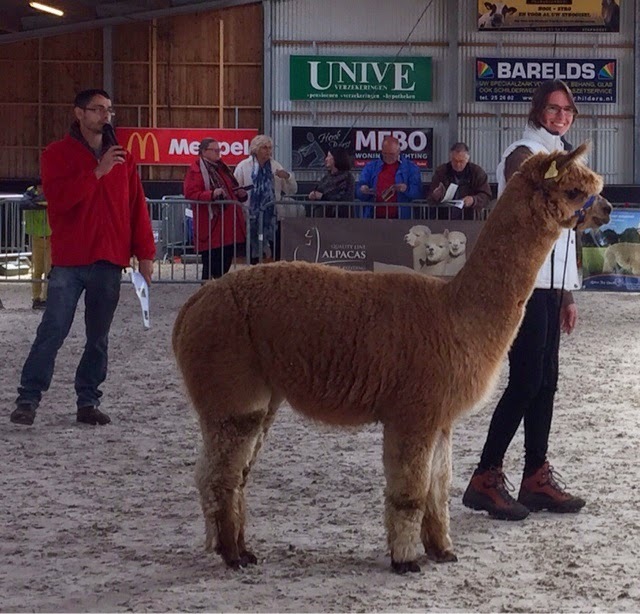 The Alpacas were superb throughout and the competition fierce in coloureds as well as whites. 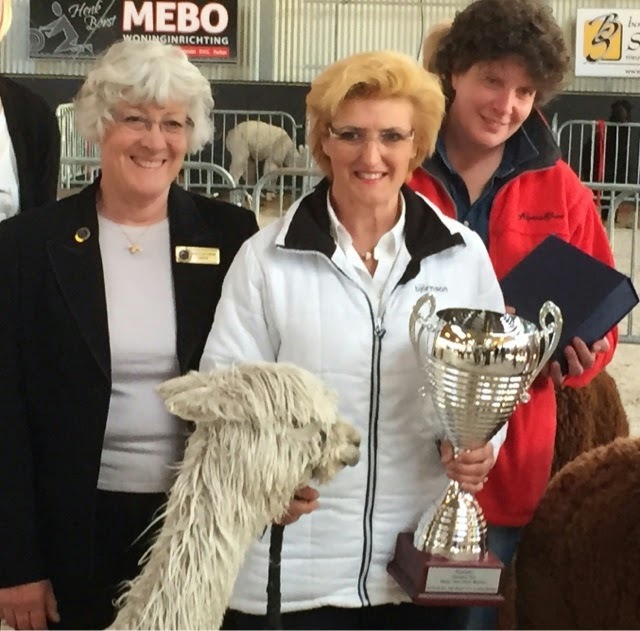 The supreme champion Huacaya went to an intermediate white Huacaya from Ashwood Alpacas who has a handle like melted white chocolate on an extremely bright, dense well organised fleece exhibiting a good uniformity throughout the blanket and between primary and secondary fibres. However there were signs that a change might now be blowing through the alpaca shed with a couple of signature fleeces emerging on two of the juniors that may be signalling the next stage of development. 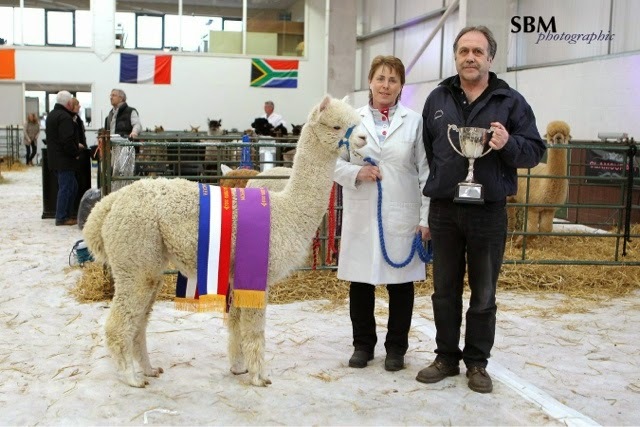 The judges choice went to a young Junior White from Houghton Hall alpacas which was as bright as a lighthouse, extremely well organised in a floppy style with density to die for in its staples whose amplitude was seriously impressive. It was very close but the young lady took it on the day however this boy will be one to watch if he grows to his full potential. 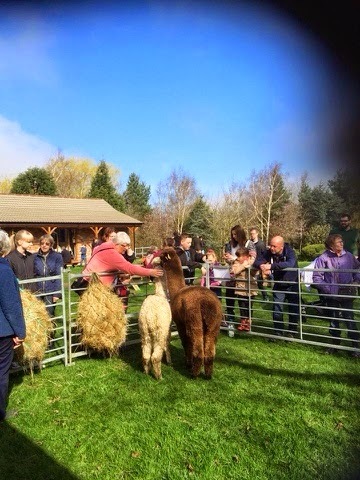 Likewise there was a small light junior alpaca from Furze Park Alpacas in the ring which exhibited similar qualities but unfortunately it needed to eat more pies to get in contention. It's going to get very exciting in years to come if we see this amount of luxury emerging and unbelievable if we can manage to get it to stay that way for ten years. Scnuzzle? 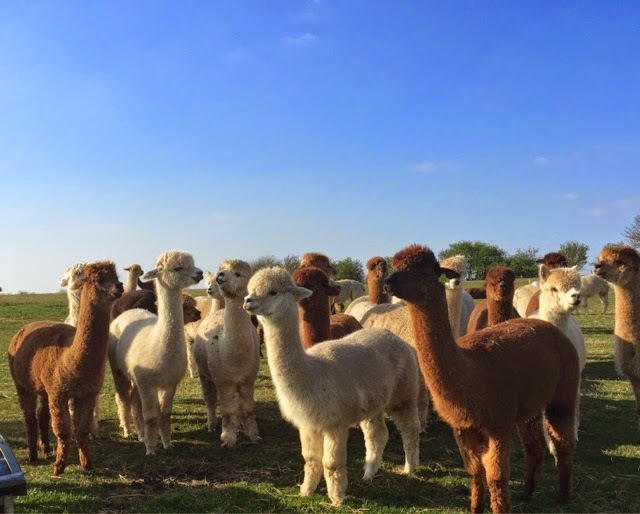 You'll want to Scnuzzle , Wuzzle and stroke your alpacas all day long if we get that good. that's of course if Scnuzzling is still legal by then! Thanks for inviting me to judge, thanks for entering, thanks for your patience and humour and I hope you all have a wonderful birthing season that lives up to your expectations...you wish! Have a great summer! The judge. 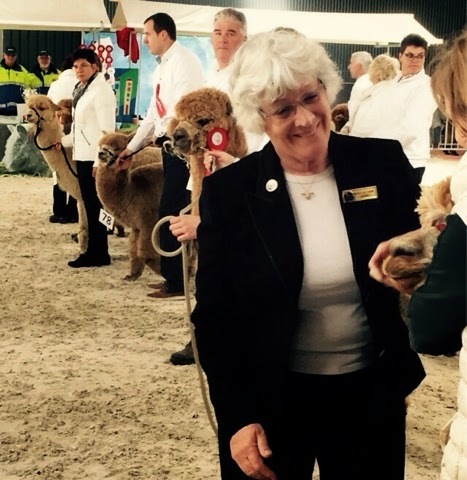 Last weekend I had the privilege of judging almost 300 alpacas in the Heart Of England Alpaca Fiesta. Two full on days from 8am to 6pm with the ring full of superb Huacayas and Suris. There were some classes of clear winners but the majority were very close and the championships set a real challenge. The standard of Suris was exceptionally high despite the smallish entry. The Suri classes were interspersed with the Huacayas and for me it works great and I hope that other show organisers decide to interlay their Suri entries in the same way. 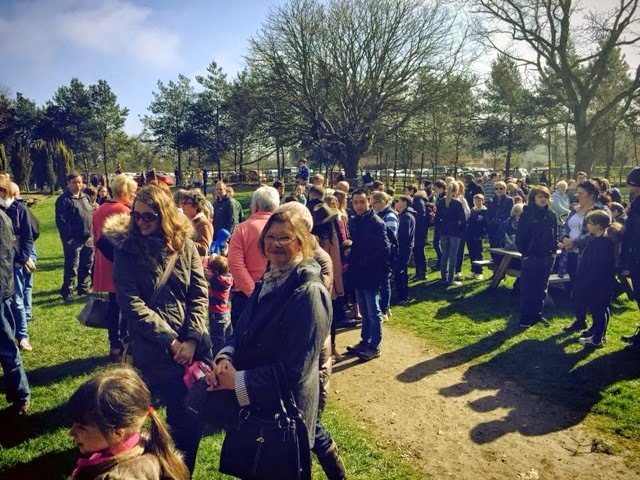 It's good for the breed, good for the breeders and creates interest and promotional points for the general public and Suri breeders throughout the show. Way to go! As for the judges concentration not a problem more of a change is as god as a rest! 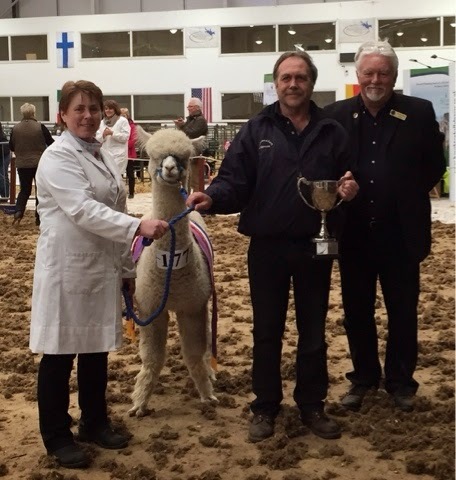 The champion Suri went to a superb Intermediate Light Female from Houghton Hall alpacas whose lustre shone deep and bright from a dense, fine, uniform fleece which hung in independent wafered layers like laminate. Lovely. Mind you there is no room for complacency in the white and lights. 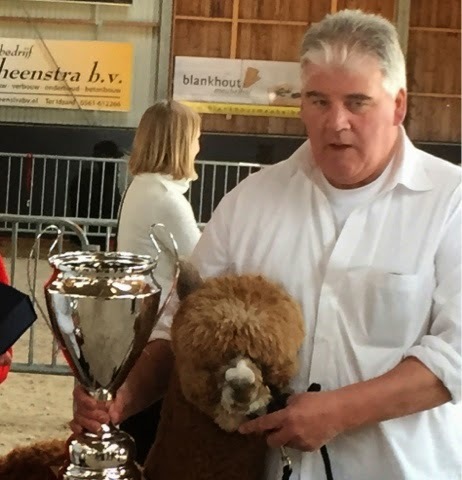 The traditional winners had better keep the ball moving because the judge's choice went to a stunning Black Junior Suri from the Backyard Alpaca Company who had lustre like wet paint and a density to die for. If that alpaca grows up to fulfil its potential then we might see a bit more colour on the cup in the coming years! 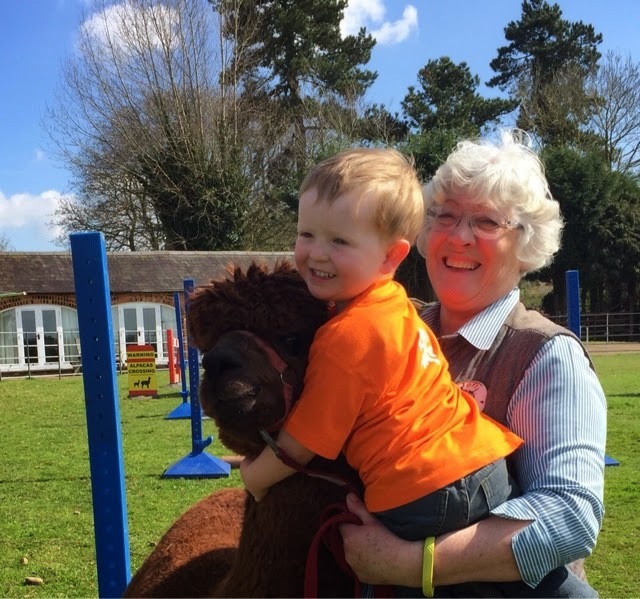 Relaxing day today after a fantastic weekend judging close on 300 alpacas at the Heart of England Alpaca Fiesta at Bury Farm near Leighton Buzzard. More on that tomorrow when I can keep my eyes open. The Judge took a relaxer today to recharge and went fishing with young Lordy in the garden pond for wrigglies. We have to make the most of the wrigglies and pond life because the smallest fish in the pond are Koi Carp and weigh about six pounds each. You don't need a net you need a harpoon. I believe the Koi are responsible for the lack of little fish- cannibals one and all. 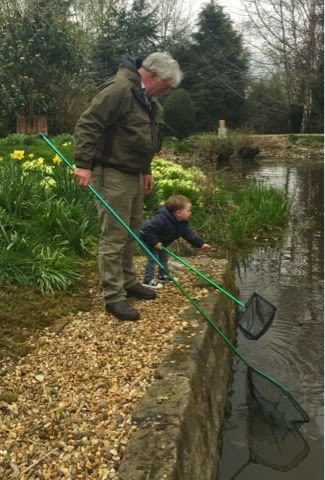 Regardless of the brutality of the fish world we had a great hour searching for whales and throwing stones in the pond. A blissful end to a great weekend and I saw not one alpaca all day. 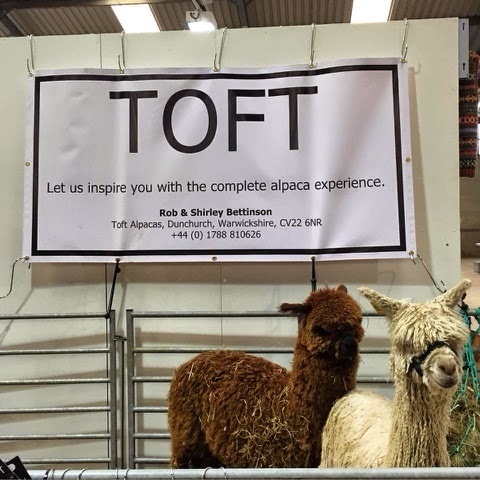 Tomorrow we get back to business at TOFT Alpaca Stud. 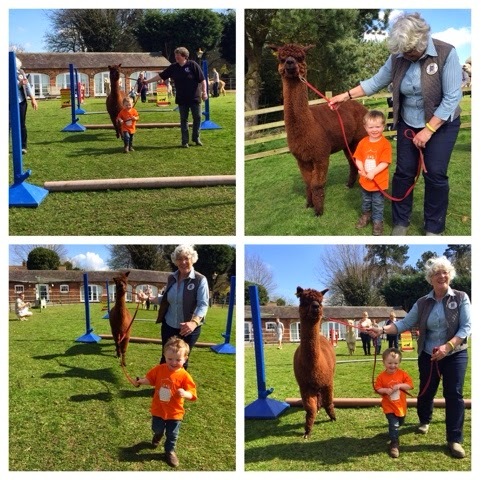 Young Lordy showed us all how to do it on the TOFT Alpaca Open day.... Unforgettably Perfick! 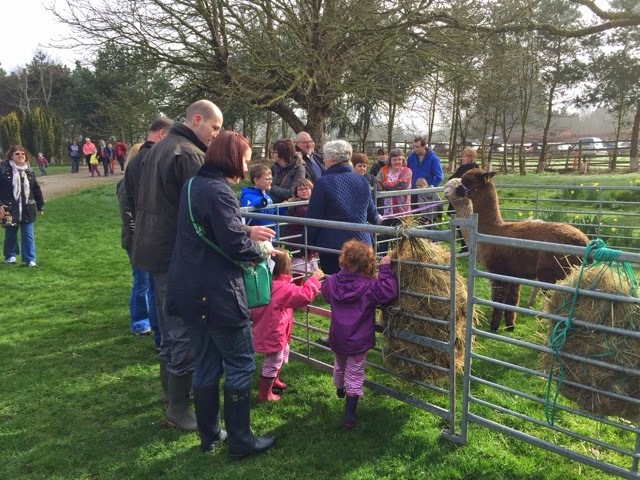 Archie the TOFT Llama and his gang of pet alpacas suffered a rainy introduction to Easter after Good Friday turned into wet Friday and stayed that way all day at TOFT Alpacas. 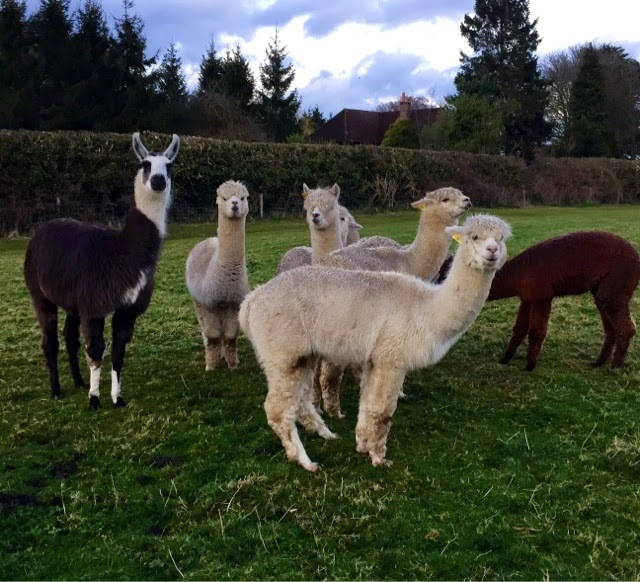 Never daunted they will be busy drying out over the weekend readying themselves to entertain the alpaca enthusiasts at the TOFT Alpaca Easter Open day on Easter Monday. The weather forecast for Monday is excellent by which time these boys will be a lot drier and of a mindset to spread a little joy and happiness amongst the people. 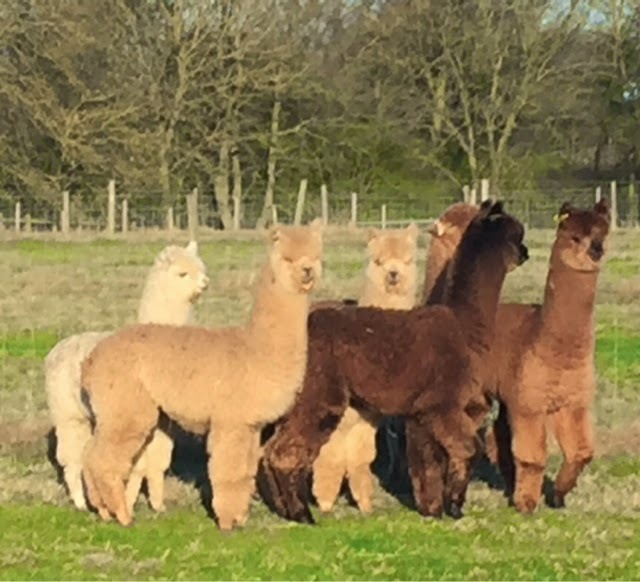 Here"s wishing you all a dry and happy Easter from TOFT Alpaca Stud. 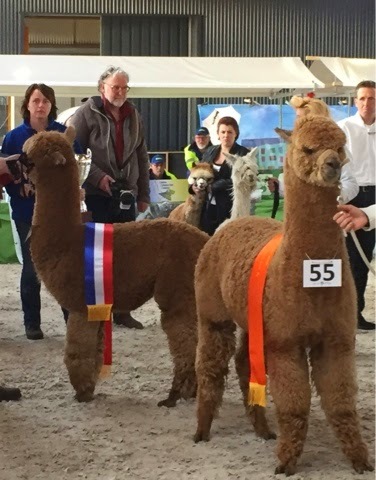 The boys and girls of the TOFT Alpaca Showteam are now officially stood down. On their return from their successes at the Ricoh last weekend they were homed in the TOFT quarantine paddocks. Where they will reside for the next month unitil they rejoin their pals in the main herd. 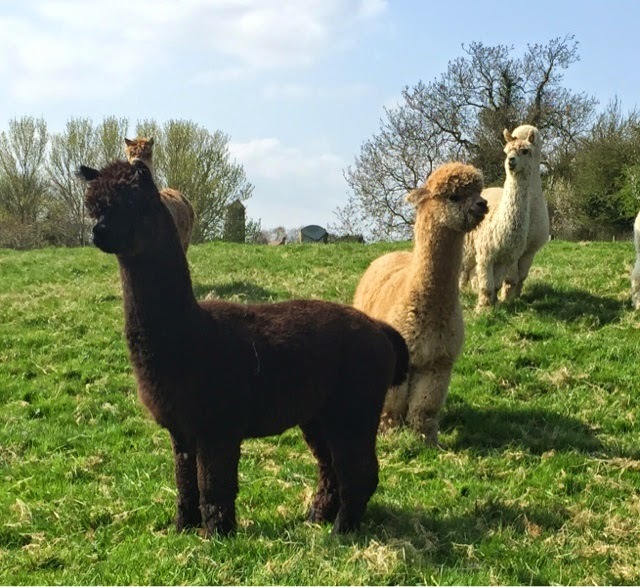 They won't be up strutting their stuff in the show ring again until October when a select TOFT team will be entered into Alpaca Showtime at Houghton Hall Alpacas. By then the makeup of the TOFT team will have changed considerably as we hope the Champion maidens will be pregnant and resident in the maternity paddocks and that some of the prizewinning males will have been sold over the summer to discerning breeders and possibly into Europe. 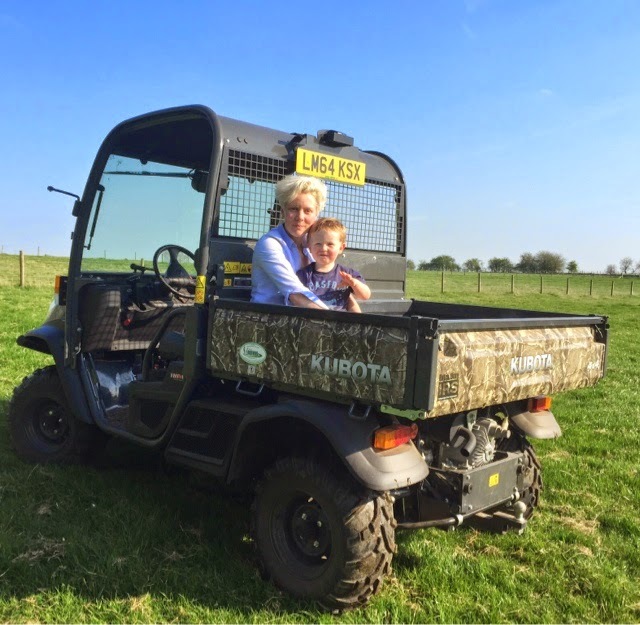 After this weekends TOFT Alpaca Easter Open Day the focus will change to the maternity paddocks as the TOFT girls will start to produce cria in early May. We shall be studying breeding charts and pedigrees for the rest of the season as we begin mating the maidens for 2016. Hey ho a mating we shall go...! Just when you think you'll have a couple of quiet days to recharge and take our foot off the accelerator the Gods provide another challenge to field and fence... 'Twas ever thus. I reckon those boys selling all those wood burners go round knocking them down on purpose... hey ho! 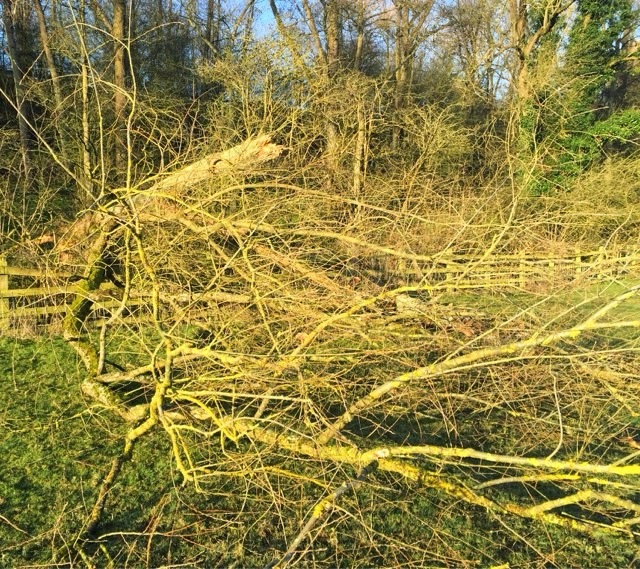 Luckily no alpacas were near this breach in our defences and it was not near of the fields needed for the TOFT Alpaca Open day on Monday. So it can wait until after Easter to be logged and have the fence repaired. The munchkins are coming up to Toft for the weekend and they won't appreciate the old fella getting them logging this lot not when we have already roped them into helping on the TOFT Alpacas Easter Open day. 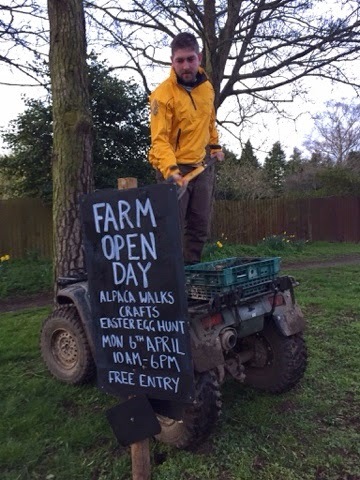 We're getting ourselves sorted for Easter and the TOFT Alpaca Open day on Easter Monday. Even our youngest son is giving the event some hammer. 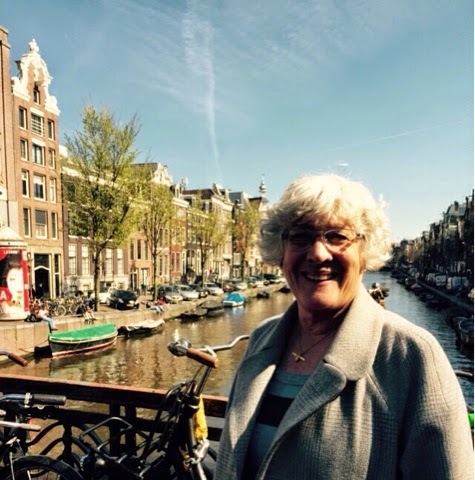 Looks like the whole family and partners will be involved on Easter Monday which will be the first time in a long while and Shirley and I will enjoy very single minute of it- Perfick....Happy Easter!